Following the 9/11 terrorist attacks, Ed Kelso, a retired FBI Supervisory Special Agent living in Quail Ridge, had a desire to give back and make a difference in his community. 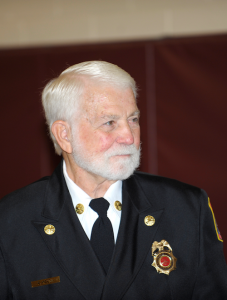 With the fire station located just a few miles away, and his six years of experience as a member of a volunteer fire company when he was in high school and college, joining Little Fork was a perfect fit. Ever since his retirement Ed has become an avid big game hunter, traveling to such exotic places as Siberia, Argentina, Canada, and all over the United States, including Alaska. He says he has seen some of the “best sunrises and sunsets ever” while he was hunting. For the past five years he has been a Hunter Education Instructor for the State of Virginia, teaching a 6-hour session for new hunters. He is also a registered Private Investigator in the State of Virginia. With his Bachelor of Science degree from Western Maryland College, his Masters of Science in Forensic Science from George Washington University, and his experience with the FBI, Ed never tires of sharing his knowledge with the next generation of our country’s leaders. Eight to ten times a year Ed travels to College Station, Texas to teach a 5-day course for first responders and planners from all over the country including, fire fighters, police officers, and city management officials. He is an Adjunct Instructor (Observer/Controller) for the Emergency Operations Training Center, Disaster Preparedness and Response, through Texas Engineering Extension Service, a part of the Texas A&M University System. He currently participates in the Enhanced Incident Management/Unified Command training program. Following his graduation from college, Ed was invited to participate in the National Football League draft by both the Chicago Bears and the Saint Louis Cardinals. Having just received a commission as an officer in the U.S. Marine Corps, he was unable to participate. He served as a Command Explosive Ordnance Disposal Officer in the Marine Corps for over 5 years. His service included two combat tours, to Vietnam and the Dominican Republic, and an assignment to Guantanamo Bay, Cuba during the water crisis. He resigned his commission in 1968. Ed has two sons and four grandchildren who live in Virginia and he looks forward to the time he is able to spend with them.